We work so hard at perfecting our photos, but many times the most important part gets overlooked. Some think skies are secondary to the photo’s story, but a poor sky can detract from the overall impact of a photo particularly in print competitions. Sky replacement used to be time-consuming and tedious even for advanced Photoshop users. There are many applications on the market for masking out skies that tout ease of use, but few live up to that promise. In all honesty, Photoshop is still the best tool for masking, however if you’re not an experienced user it can seem complicated. A few clouds may be just what the doctor ordered! Not all skies need full replacements; they may just need a little help. Let’s say you captured a brilliant blue sky, but it’s cloudless and boring. StudioMagic 2’s Compositor tool includes Cloud Creator. Cloud Creator gives you access to a library of masked clouds that with a click can be automatically placed into your photo, resized, and adjusted for intensity. The cloud is placed with an automatic mask so you can brush away what you don’t need. 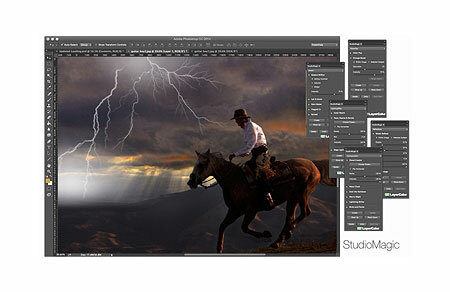 StudioMagic 2’s Cloud Creator is a quick and easy way to put life in an ordinary blue sky. The trick is to place a few clouds from the library at different sizes to give you depth and perspective. You can also transform the clouds by flipping them with the flip horizontal selection tool, and then they can be overlapped and erased from the mask to build a realistic looking grouping. If your sky is approaching sunset yellow and red, use the Color Match tool under LightingEffex to adjust the cloud’s color to match the overall sky. LayerCake has stand-alone collections of drag & drop clouds and cloudbanks as well, but for ease of use and saving time, the StudioMagic 2 is the best option. To see tutorials on sky replacement click here. Don’t be afraid of the ultimate makeover! Sometimes there’s no getting around it. You shot a beautiful landscape, but the sky is white and blown out. It’s just a fact of photography, when you expose for the landscape the sky will be overexposed, expose for the sky, the landscape will be underexposed. So what’s the solution? A smart solution would be to put your camera on a tripod, shoot one exposure for the landscape, shoot a second for the sky and marry them in Photoshop. Unfortunately, few of us think of that when we are trying to get the perfect framing and we left the tripod in the car. StudioMagic 1’s CutOut tool and LayerCake’s sky collections fix all that pretty quickly. In this example you’ll be using the Detailed CutOut tool because of the delicate tree branches intruding into the sky that we intend to replace. Notice that the image has a pond with the blown out sky reflecting in it as well. In order to make this replacement look realistic, we’ll need to select both the sky and the pond area for removal. Next we need a sky. Now if you have a collection of your own skies, by all means use those. But if you don’t, LayerCake has beautiful collections of skies that include all types, from sunsets to stormy. Once the sky and the pond has been removed, place the new sky on the layer behind the CutOut landscape. The sky will look great, but the pond will look funny. That’s because the pond is a mirror so the reflection needs to be upside down and reflecting the new sky above it. Which means you need to make a duplicate layer of your sky, flip it upside down and roughly reposition it to match the sky above. Now turn off your landscape layer, and with your rectangle selection tool, select the area from just below the horizon up to the top of the image and hit delete. Turn your landscape layer on again and you’ll see that the sky and the pond reflection are now correctly matched. Original sky and pond area removed with StudioMagic 1 and replaced with a LayerCake Sky. We all go for the most dramatic, but it may not match the light in your image. First off, if it’s bright daylight, a sunset will never match. If you place a sky but the horizon of your landscape appears to be lighter than the sky, that’s an indication that the sky doesn’t match the landscape’s lighting. Now there are a few things you can try, first a lighter sky; most times that will fix the problem. If your sky is still too dark at the horizon, use a broad soft eraser tool to lighten the sky from the horizon up about a third of the way until the bottom of the sky blends with the horizon. Another trick is you use your burn tool to darken the horizon to match the sky. Sometimes it’s a combination of the two techniques. Another thing that gets overlooked is direction of light. How often have you seen composites that look a little strange but you can’t quite put your finger on it? Unfortunately, good print competition judges pick up incorrect lighting right away, and once they see that, they start looking for more Photoshop tricks that have gone awry. Stand back and view your entire image for a minute, look for the direction of shadows and the angle the light is coming from. If shadows go right to left, the position of the bright area in the sky needs to be coming from the right. Flip the sky if need be. If the shadows are short, it’s closer to midday and the sun angle is higher in the sky. If the shadows are long, the sun’s angle is lower and an afternoon sky or sunset may be more appropriate. with StudioMagic 2, balanced with ColorMatch and LightBrush. StudioMagic 2’s LightingEffex tool offers a library of Rays, Beams and Bursts that are easily placed with a click of your mouse. On most skies you can place a burst with a light ray where you want the direction of the light coming from. In many cases, by placing this new light source in a convincing position based on shadows and overall angle of light, you can fool almost any eye, even those pesky print comp judges!